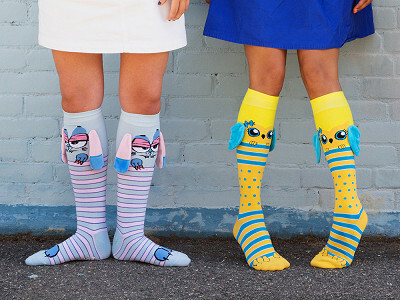 These socks with ears pledge to add color and personality to your outfit. 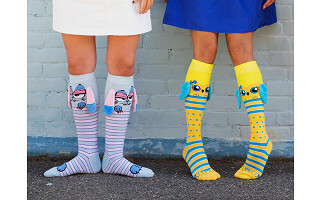 Each pair of this knee-high hosiery has its own vibrant personality, complete with little ears or wings that flap when you walk. Maker Olga Kay is a trailblazer. 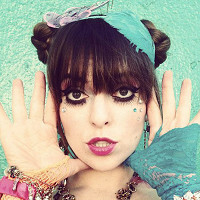 At 14 she left her small village in Russia to join the circus and eventually became a famous YouTube personality. When she designed MooshWalks she knew for certain they had to stand out and start conversations. Olga did that and more. Wear a pair and you’ll definitely be noticed. 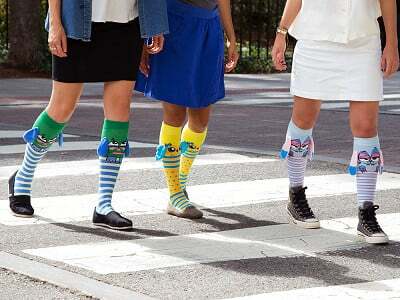 Even though the socks are attention-getting, we found them to be soft and durable, too. We suggest wearing them with a dress or shorts to ensure a full-length view of the lively, lighthearted characters. Hello everyone! I'm excited to share my MooshWalks knee highs with everyone visiting The Grommet. I'll be happy to answer your questions today! These are adorable! My son loves crazy socks, but everything I'm seeing looks very girl-oriented. Any chance you have some designs coming along later that will feel more appropriate for boys? Hi, do you make them for small children? I think my 2 year old granddaughter would love them! @Miriam thank you for your feedback, we will consider that in the future. What a great idea! My daughter will have so much fun wearing these. Do they need special car when washing or drying? Can I throw them in the machines? @Virginia you can absolutely wash them in the machine. You can also turn the ears inside of the sock if you are worried for your first wash or put them is a garment bag. Will you be making these in smaller sizes also? My 4 year old granddaughter would LOVE these!!! 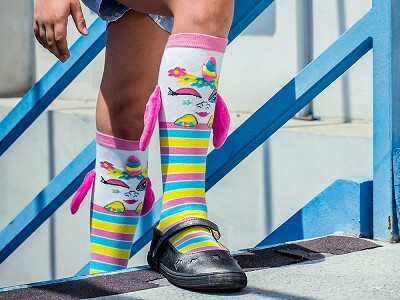 @Chris Yes hopefully in the future but in the past 5 year olds were wearing these and they are more like thigh highs for them but still doable. What shoe size range would these be? @Guest size 5-13 they stretch well. Will there ever be an option to chose your own set of three pairs for $45 ? I'd be more likely to buy if I could chose the three pairs and I imagine others would too . @Joyce We don't have this option at the moment but thank you for your feedback. Could you share which pairs would you group together? I'd love to get these for my granddaughter. Do you have plans to make them in sizes for younger girls?? @Roxanne Girls as young as 5 year old wear these. For younger girls they just become a bit longer and above the knee instead of below the knee. Hi Mary, on the next page you can select the name to have the image brought up or hover over the image to see the name of each sock. Your socks look cool but are not for me. I would love someone to help the older ones of us with some hindered sight to distinguish sock color. I can not tell black from dark blue, an embroidered letter/s or toe pattern. Lots of us out there. I would not mind the pattern in my shoe like yours. Can you help? Hi Fred, is there a particular sock you were interested in? I can help describe it so you know exactly what you're getting. Im buying four of these for my granddaughters.....I'm sure they will be fighting over who gets what since they are all really cool.....keep up the good work....would like to see more designs in the future......Good Luck! @Tom Thank you so much Tom, we are working hard to create new product as we pack your order! do they fit plus size calves? @Joan they do stretch well but tend to be a bit tight around the face area. Always recommended to wear them a little bit lower than a knee high sock by turning them into an ankle sock instead.